I love protein smoothies after working out. 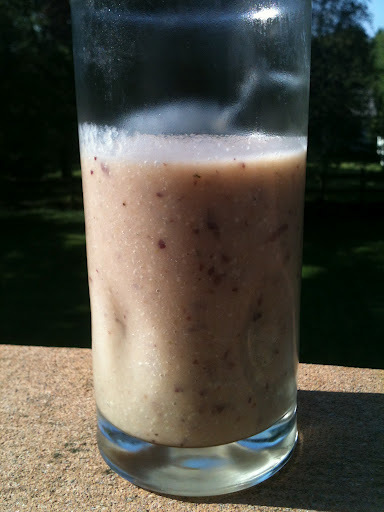 I had recently frozen some peaches and knew they would be a perfect ingredient for a fruity smoothie. Instead of adding my usual protein powder, I thought about switching it up and adding hemp seeds, which are very high in protein. The combination was perfect and so delicious! I really enjoyed this after my workout! 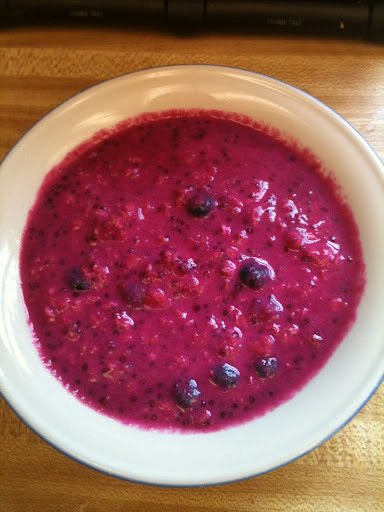 Thaw fruit so that it will easily blend in a blender (unless using a high speed blender). Combine all ingredients in a blender and blend until smooth and creamy! 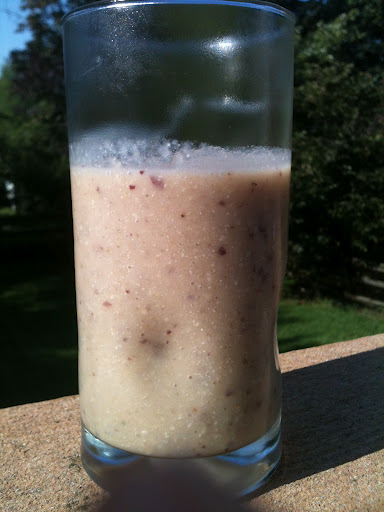 *If you don’t have hemp seeds you can omit this ingredient and just make a peach smoothie. 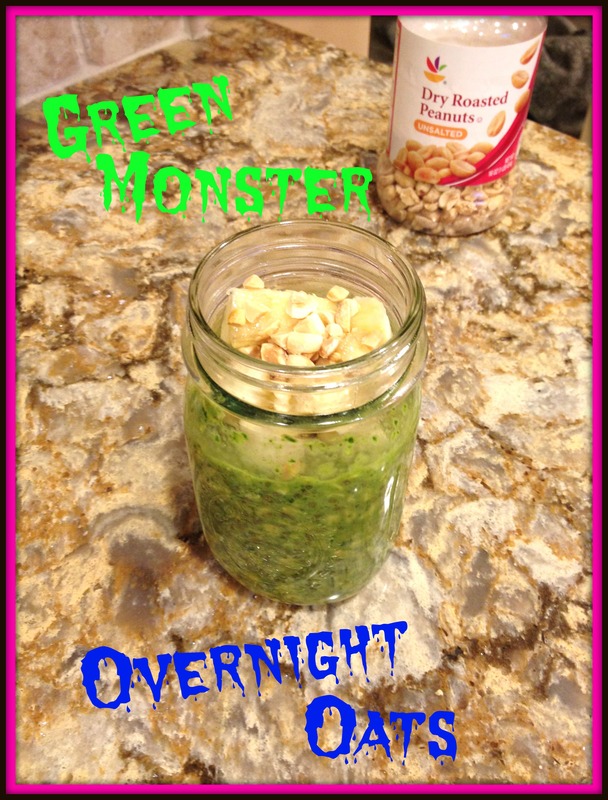 Or maybe try adding some nuts to add some protein to this smoothie. Tip: To have fruit thawed and ready to go right after a workout, I actually put the frozen banana in the fridge (they thaw really fast and I wanted it thawed and cold, but not brown and warm) and put the frozen peach on the counter to thaw before I went to work out. When I got home the fruit was at a perfect state to be blended into my smoothie. This was super quick to make after working out so that I was able to get all that nutrition right when my body needed it most! 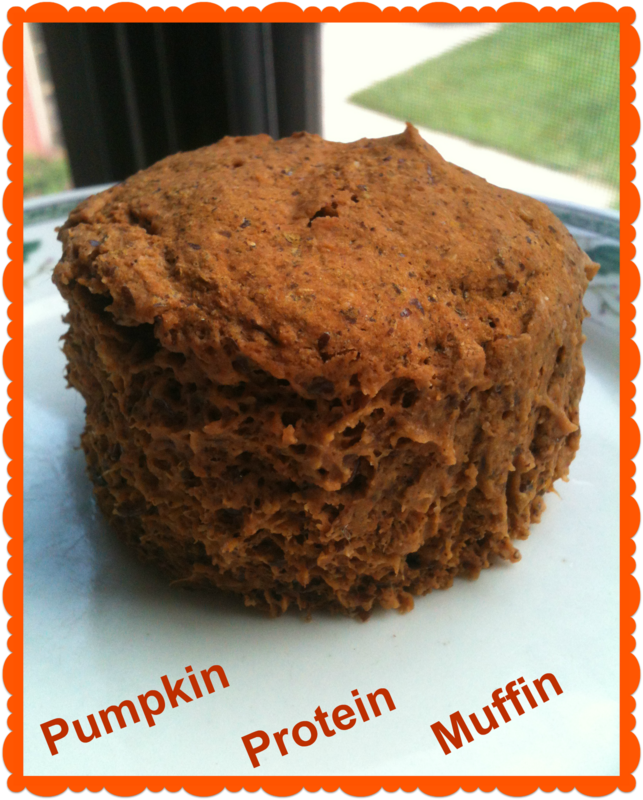 I have been seeing a lot of microwaveable protein muffin recipes floating around. They look so good as a way to start the morning since they are packed with protein and can be made so quickly. Unfortunately, most of the protein muffin recipes I have seen include an egg. I have tried so many times to replace the egg with a flax egg but I guess my wet to dry ingredient proportion was off because my protein muffins were not working out – they were too soupy. I finally came across this one that didn’t require an egg, but already included a flax egg in the directions, so I thought I would give it a try and I’m glad I did! It was so easy, came out perfectly, it was filling, and delicious. What a great healthy, breakfast! In a microwave-safe bowl, ramekin, or mug combine protein powder, cinnamon, and baking soda and mix together. Add in vanilla, pumpkin, and flax egg and mix until well incorporated. Microwave for 3 minutes, watching carefully that it does not spill over. Let it cool for 1 minute. Then, take a knife and loosen the muffin from the side of the bowl. Flip it over onto a plate. Top with maple syrup, nut butter, jam, yogurt, etc. While your already measuring out the ingredients for one, you might as well make a few extra. (That pumpkin will need to be used anyway :-p ) Plus, then you will have some ready to go breakfasts for days when you need to grab something quick. These muffins can also make a great snack or dessert! 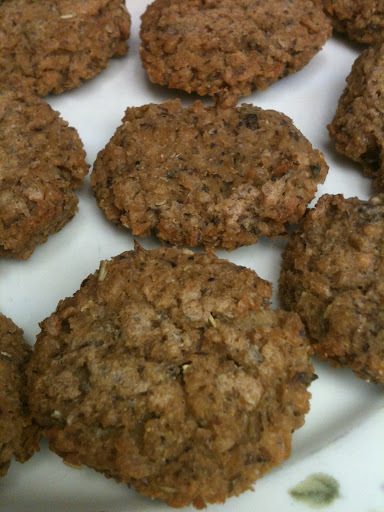 About a week ago I made these Chickenless Nuggets with Textured Vegetable Protein (TVP) that someone gave me. 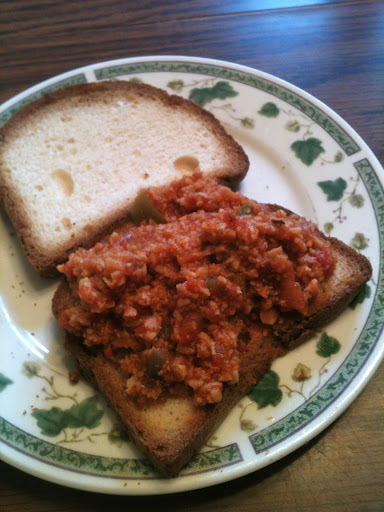 I noticed the sell by date was getting close so I googled some ideas on what I could do with the rest of the TVP and came across this recipe for sloppy joes. OMG! 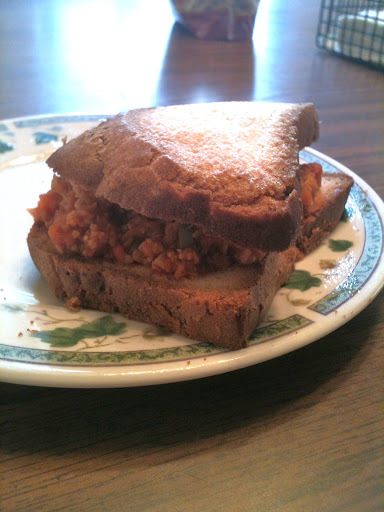 I have not had a sloppy joe in years, but this stuff tasted just like Manwich, only it was better because there is no meat. Saute the chopped onion and green pepper in olive oil over medium heat for 3-5 minutes. 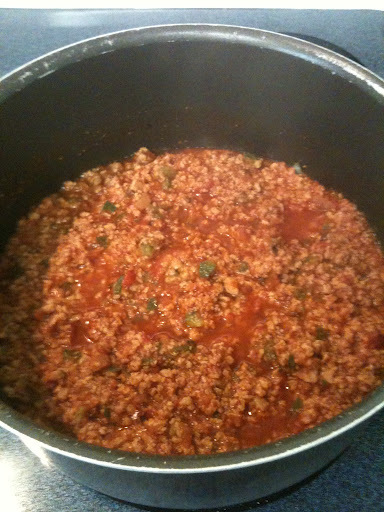 Add all other ingredients and simmer together over medium low heat for 20 minutes. Do not be overwhelmed by the ingredients. It took me maybe 3 minutes to chop the onion and green pepper (I used a food processor) and another 5 minutes to saute them. Then while that was sauteeing I measured everything else out. Finally, I added everything in the pot and did some other things for 20 minutes. 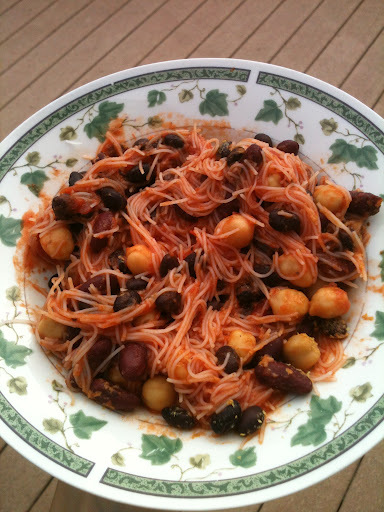 This meal is very minimal prep work, very simple directions, very easy clean up, very tasty! It practically cooks itself! Next time I make this, I’m doubling the recipe so there will be more leftovers! I am roughly estimating that this makes about 8 servings. One serving (without bread) is approximately 138 calories and 9.5g protein. I bought some beets for this Beet Juice (which was very tasty btw) but the beets I bought came in a pack of 3 and I only needed 1/2 a beet for that juice. The other 1/2 of that one beet went into a juice that didn’t turn out right 😦 But I still had 2 whole beets left. Instead of just boiling the beets and eating them plain or in a salad, I kept my eyes open as I read blogs and surfed the internet hoping to find a new recipe to try for anything that had beets. Surprisingly I found one and it used beets for breakfast in oatmeal! I never would have thought of that idea so I tried it out. 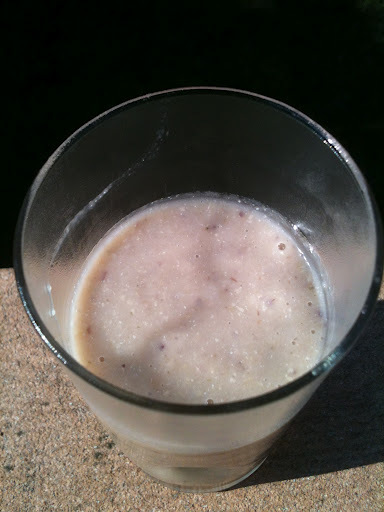 In a blender, puree beets and almond milk together until smooth. 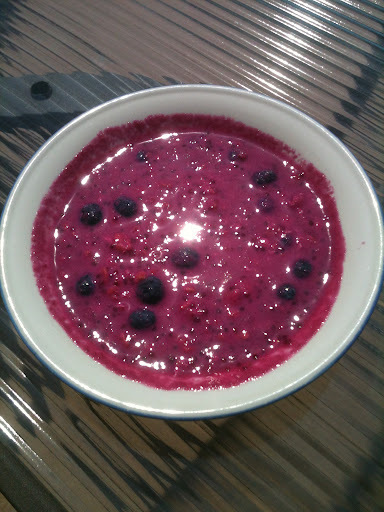 Pour into a mason jar and mix in chia seeds, oats, and blueberries. Put in the fridge overnight. 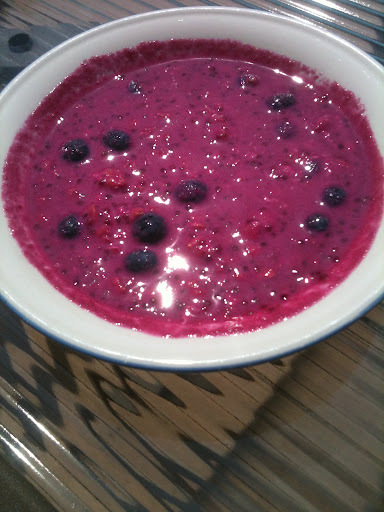 In the morning, add sweetener and if desired top with additional blueberries. 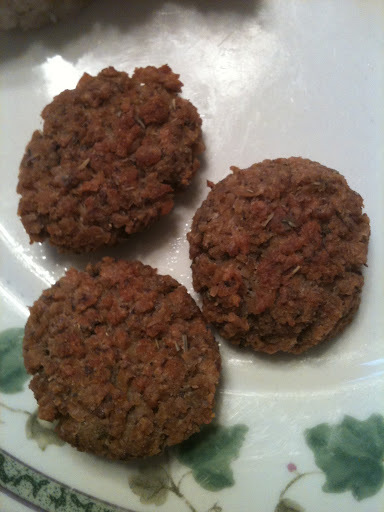 It is the 4th week in Meatless Mondays from A to Z so today’s recipe was inspired by Dates. Oh, and it is also Banana Lover’s Day! When I came across this recipe that included dates and bananas, I knew it would be perfect for today! The original recipe calls for 2 small bananas and 2/3 cup almond milk. My bananas were big so I used 1 full banana and 1/2 of another. I also reduced the almond milk to 1/3 because the batter was already very liquidy. Place the dates in a small bowl and cover with the boiling water. Set aside to soak until they are soft. Preheat the oven to 300F and line a baking sheet with parchment paper. Set aside. Place the bananas, dates, and date soaking water in a food processor or blender. Blend until a paste forms. Transfer the mixture to a bowl and add the almond milk. Stir until combined. Add the remaining ingredients and mix until evenly combined being careful not to overmix the batter. Spread the mixture along the bottom of the prepared pan and bake for about 40 minutes. Remove from the oven, let the bars cool, and cut into individual servings. 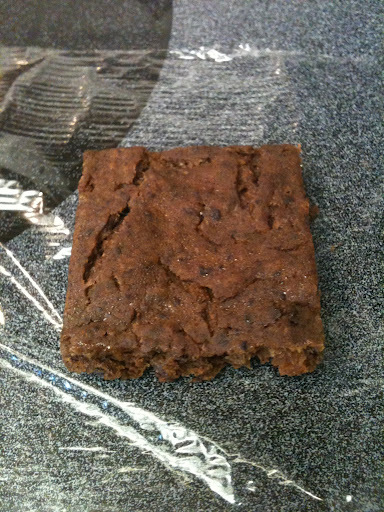 (I cut mine into 9 squares). Wrap each bar with suran wrap and store in the fridge. I actually baked my bars for 45 minutes and the bars were still pretty soft. 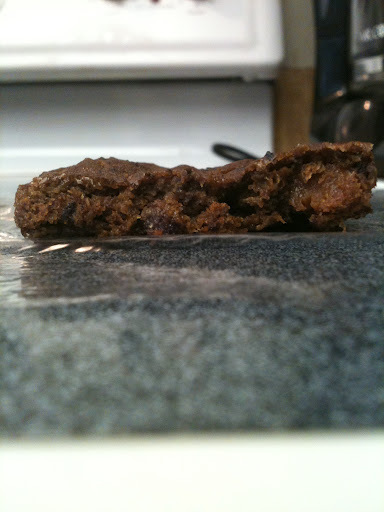 After cooling the pan, I actually put the mixture in the freezer to freeze before cutting because they were so soft. I think next time I make these I will omit the baking soda and just put them in the freezer until they harden before cutting and wrapping each bar. I’m also storing these in the freezer so they will continue to hold together well and last longer. When I want one I just take it out for about 5 minutes before eating! I’m sure these also taste great warm. If you store them in the fridge, you only have to heat them up for about 10 seconds before enjoying! Even though these bars didn’t come out as expected, I really enjoyed them. The flavors of the banana, dates, and cinnamon really stood out. I love how these bars are packed with protein and naturally sweetened for a sweet and healthy treat! 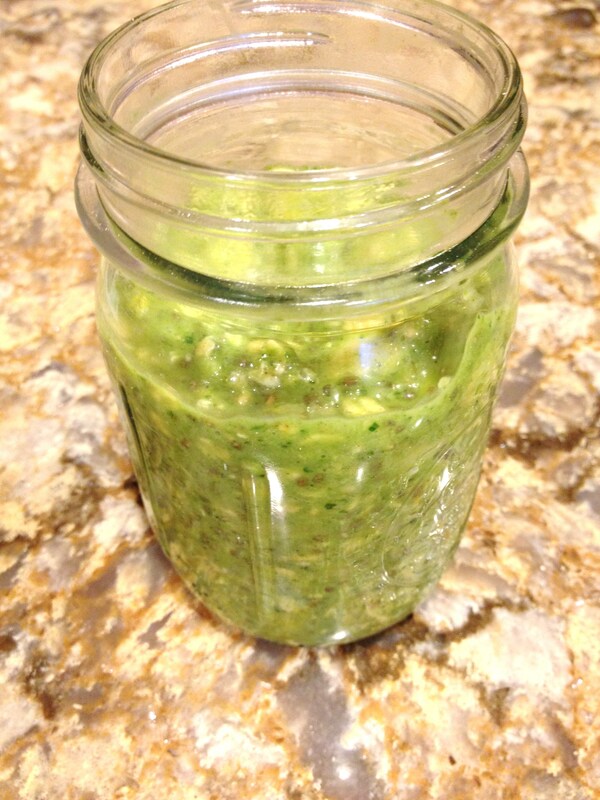 Here is a yummy way to get extra veggies! Instead of mashed potatotes, it’s mashed cauliflower. Bring a large pot of water to a boil. Add prepared cauliflower and cook until tender. 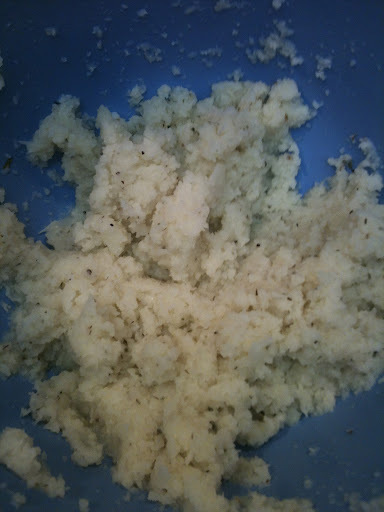 Drain cooked cauliflower and transfer to a food processor and pulse until the cauliflower is broken down. Add thyme, salt, black pepper, nutritional yeast, garlic, almond milk, and lemon juice and blend until smooth and creamy. You can also add additional seasonings or adjust measurements to your taste. Serve this side dish hot! 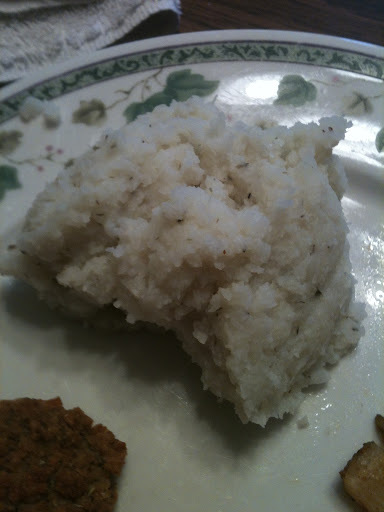 This mashed cauliflower is quick, easy, and very tasty! 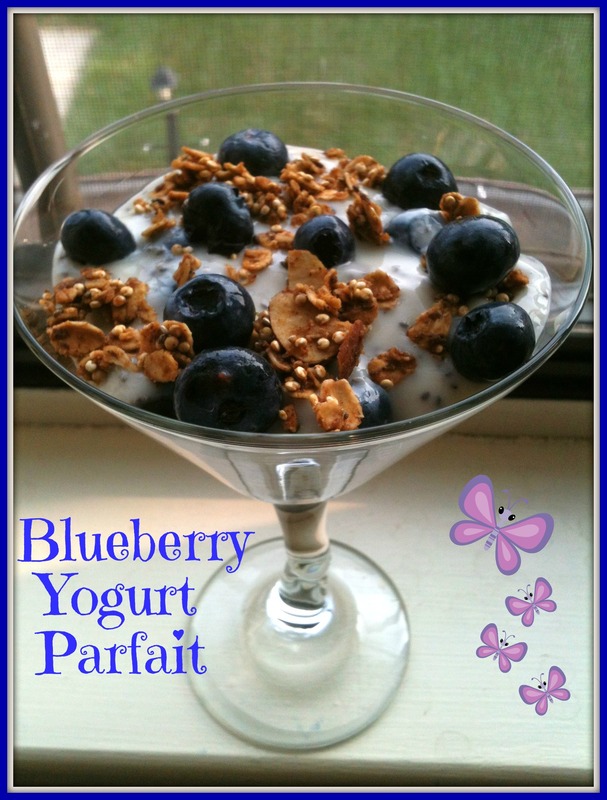 I had another yogurt parfait for breakfast this past week, this time with blueberries! I followed the same recipe as my other two yogurt parfaits, Peach Yogurt Parfait and Cherry Yogurt Parfait, just switched up the fruit. Stir chia seeds into the yogurt. Layer the parfait however you want. I added blueberries, then yogurt, then granola, and repeated. If desired, sprinkle additional chia seeds on top! I should try combining different fruits together sometime! I was in the mood for some nuggets the other day for dinner. 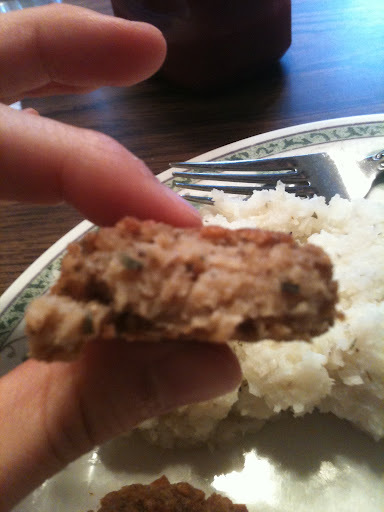 At first, I thought I would just turn a recipe for bean patties into smaller bite-sized nuggets. But then I remembered that someone had given me some Textured Vegetable Protein (TVP) that needed to be used so I googled recipes for nuggets using TVP. This recipe was perfect because I do not like breading nuggets since it is so hard to find bread crumbs (or crackers to turn into crumbs) that are gluten free and vegan. Plus it was a very simple recipe! Combine boiling water with a vegetable bouillon cube in a medium bowl and stir until dissolved. Add TVP, stir, and set aside for 5 minutes. In a food processor, pulse the soaked TVP until it is broken down into smaller pieces (but not too small). Add flax egg and flour and mix until well combined. Season with any spices you would like and mix to combine. Form nuggets with your hands and place on a prepared baking sheet. Bake in the oven for 10-15 minutes, flip, and bake for an additional 10-15 minutes or until golden. I was able to make about 15 nuggets with this recipe, but the amount will depend on the size nuggets you form. The TVP definitely added that chicken like texture and the seasonings gave these nuggets a great taste. This recipe was so easy to make and required very little clean up. The inside of these chickenless nuggets! I will definitiely be making these again! 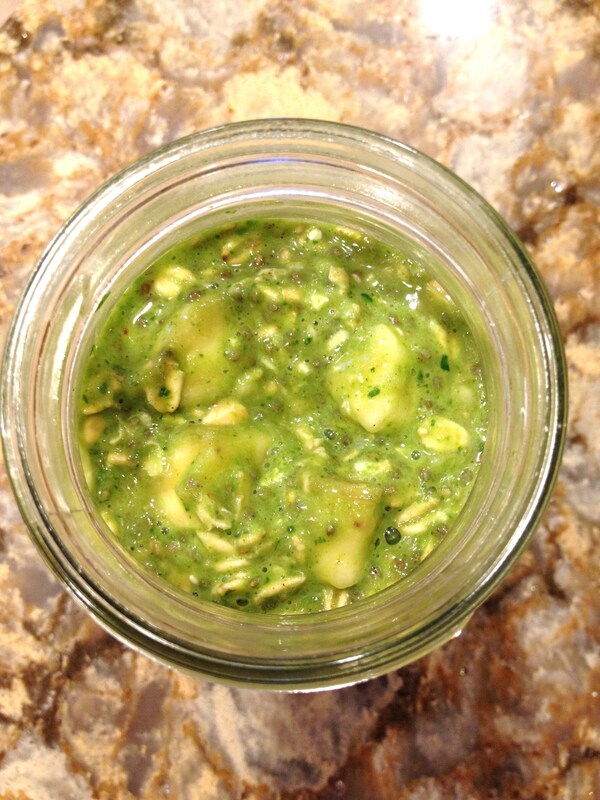 Update: This recipe has been updated on 3/17/14. I made this oatmeal for St. Patrick’s Day and took much better pictures! 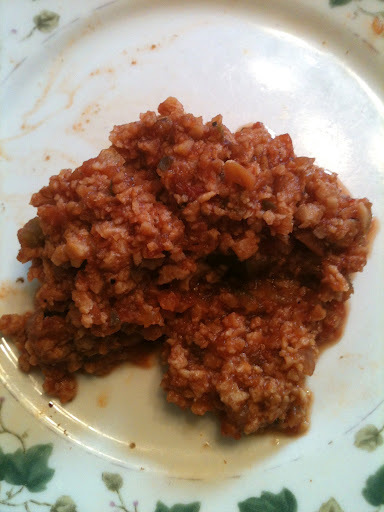 (The ones up before this were embarrassing and totally unappetizing looking haha.) 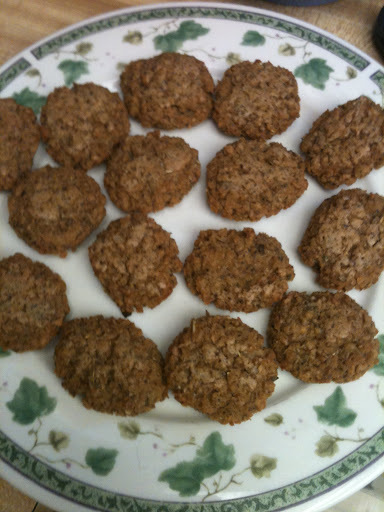 Even though I updated the pictures, the rest of the post has not been updated, so the oatmeal recipes below are only my first few. Click here to see ALL my oat recipes! 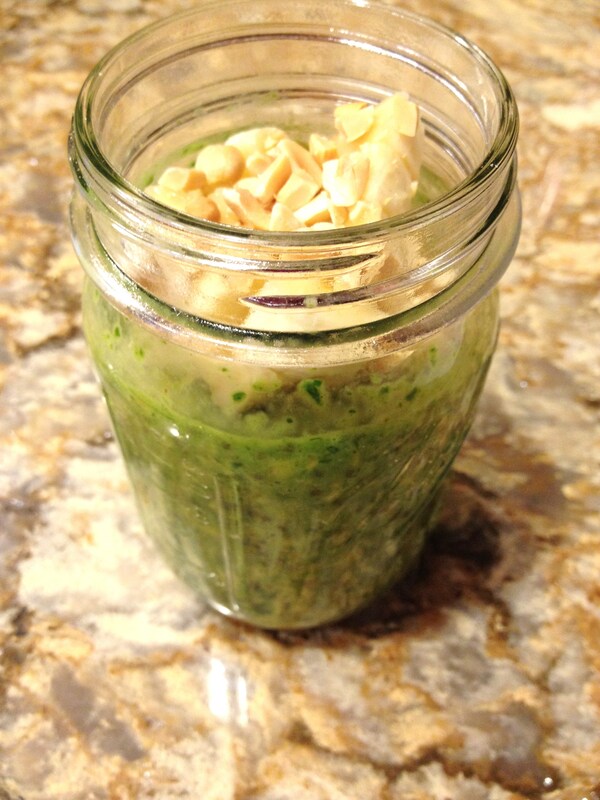 Today’s recipe includes leafy greens, which is a great way to start your day! 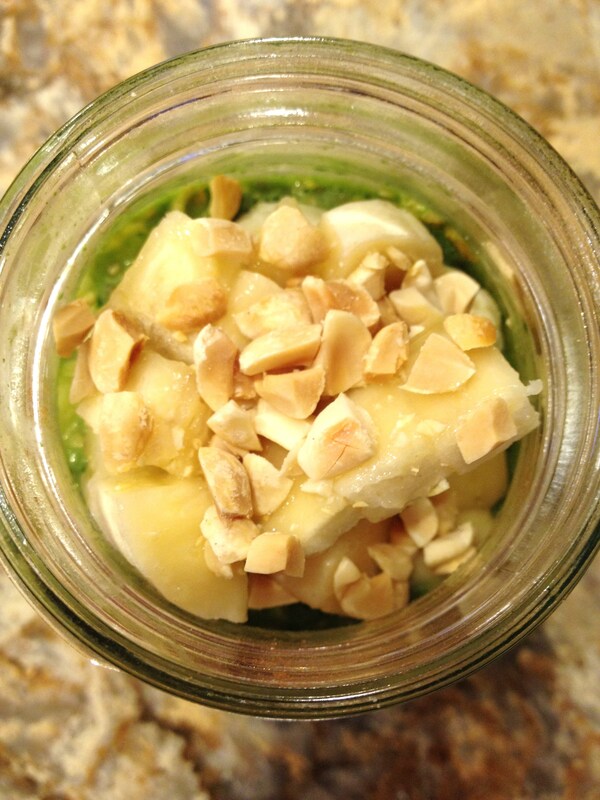 In a blender, blend together spinach and almond milk until smooth. In a glass jar (or cereal bowl), combine the chia seeds, oats, and cinnamon. Pour the spinach and milk mixture on top and stir until well combined. Mash half the banana with a fork and stir it into the oatmeal mixture. Slice the other half of the banana and add it to the oats. Place in the fridge overnight. In the morning, stir and add optional sweetener and any desired topping such as nut butter, granola, coconut, fruit, etc. and serve cold. I added the other half of the sliced banana to mine in the morning to keep it as fresh as possible and added crushed peanuts! This is what the oats looked like before adding banana slices and peanuts! I love how brightly green this breakfast becomes without any artificial colors! And the best part is you get a serving of vegetables first thing in the morning and you can’t even taste them, mostly just banana! Based on using Trader Joe’s Gluten Free Rolled Oats, Original Silk PureAlmond Milk, and 1 banana, this recipe yields approximately 350 calories and 11.5g protein. About a week ago I posted my 3 Bean Taco Salad I made with black beans, chickpeas, and kidney beans. I mentioned how since I only used a few spoonfuls of each type of bean in my taco salad, I had plenty of extra beans in the fridge ready to be eaten. After enjoying my spicy taco salad with the 3 different beans, the next day for dinner I was ready to use the 3 different types of beans in a pasta dish. This meal, just like the taco salad, was super easy to make; it doesn’t even really call for a “recipe” since all I did was combine pasta, sauce, and beans! Directions: Cook pasta according to package directions. 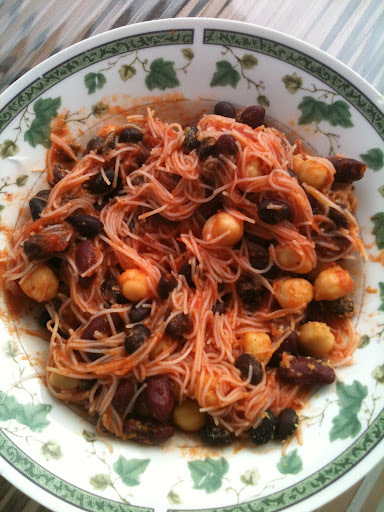 Once the pasta is cooked, add marinara sauce and beans and top with nutritional yeast, if desired (for a cheesy taste). You could also use a different variety of beans and more types or less types of beans. I needed a quick dinner and this couldn’t have been more simple!